A few months ago, on a particularly boring Friday, I headed to Eataly for the first time in hopes of a little culinary adventure. I wandered through the aisles gawking at the extreme prices for imported products and perfectly shaped, colored and textured produce for about an hour before finally adding a few items to my cart: a loaf of an herbed boule, a thin package of sopprasatta and a triple cream cheese from the Northeast. Simple foods that could be eaten with no ornament and very little preparation. And then I discovered the cookbook section. What caught my eye was the simple black and white photography of Paul Bertolli’s Cooking by Hand paired with extremely detailed tutorials to get the techniques. With whole chapters devoted to a single ingredient like tomatoes, balsamic vinegar and sausages, the book absolutely insists on knowing raw ingredients intimately. It also has compelling autobiographical passages that help you to understand the identity of the chef and how his understanding of food has developed. It’s the kind of book you can read cover to cover, where recipes aren’t just a takeaway for readers to photocopy, decontextualize and reproduce. Every recipe is evidence of his journey to understand food and become a chef. Later, when I began recording what I had done in the kitchen, I found that I was no more comfortable writing a recipe than following one. Studying my food-stained notes, I was annoyed at having to go back and measure in cups and teaspoons the ingredients that I had originally added according to taste and feel. Any good cook knows how to dose salt in the right proportion to food by the way it feels in the hand. Take that dose, put it into a measuring spoon, and it might come up fractionally short or overfill the brim. When a cook creates a recipe to fit standard weights and measures, the measures themselves creep in to exert control over the cook’s better instincts. Precision is lost. Weight rather than volume measurement is the more accurate way to record the amount of any ingredient. But it likewise puts an object foreign to the creative context between the cook and the food. As my friend Richard Olney said, the act of recording a recipe “robs it of the license responsible for its creation.” Ultimately it is the reader, the presumed learner, who is left bereft. Subtleties in the way food looks, smells, and behaves are lost when the process of cooking is reduced to a series of simple and efficient steps. Such is the unfortunate legacy of almost all recipe writing. This passage gives me so much life! Bertolli understands my struggle. Writing down recipes, or even measuring as I cook, is something mechanical that interrupts the natural and instinctual process of throwing things together in a way that suits my tastes, skills and experience. Recipes create constraints on dishes that are made at the whim of what’s seasonal at the market, on sale at the grocery store, or leftover in the fridge from another meal. Unless I’m testing dishes for a crowd (or baking), I almost never make something exactly the same way twice. That’s especially true of the simple pasta dishes I prepare all-too-often for weeknight meals after a rough day at the office. I don’t have time to follow a recipe then; no time for standardization or rules. But recipes don’t have to imply mechanical reproduction. Once you’ve mastered the basic techniques, every recipe is like a madlib. You can start off following the ingredient list but replace this ingredient for that one, blend two recipes together, or create a deconstruction. It only takes the confidence to know that you are by no means messing it up because the author of that recipe expects that you will take the license to adapt it to your needs and tastes. Recipes are not rules and there is no wrong way to cook. It’s all blurred lines. 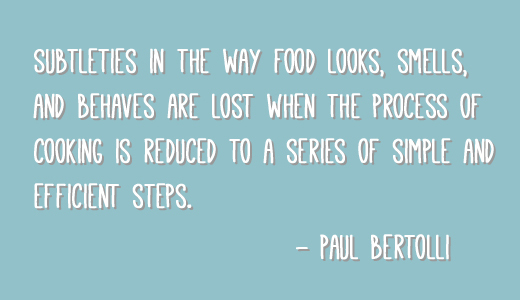 So that is why I like to wander through grocery store aisles, scroll through Pinterest, and collect cookbooks. I’m not looking for specific recipes to follow, but ideas for flavor pairings, presentation inspiration, and ratios of spices. These experiences expand my vocabulary of food and empower me to stray from the written word of the recipe and create wholesome and delicious new dishes. I hope the realization that chefs too struggle to solidify the idea of a dish into a recipe will liberate you to take risks, change things up, and produce dishes that perfectly suit your identity. In Season: Try Paul Bertolli’s dairy-free, low-calorie, and inexpensive recipe for Cauliflower Soup over at Food52.